Dance for a good cause. 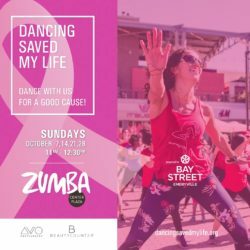 Join the community of dancers as you raise money for women currently dealing with cancer. All funds raised will support stress reduction retreats for women dealing with a cancer diagnosis. Zumba instructor, Andreina Febres, along with special guests, will lead fun, welcoming & easy dance classes during the month of October.